Japanese Imperial Army Type 89b I-Go (Number One Design) Otsu tanks of the 1st Company, 7th Tank Regiment, 14th Imperial Japanese Army, crossing a bridge on Highway (Route) 5 during the advance on Luzon on January 2, 1942. The National Archives caption says it is Route 6 but that was a trail impassable to tanks. According to most sources, this view was taken the same day Manila fell. They are following a Type 89a Ko that is out of frame as it already passed. The Ko had a gasoline engine, a slight different turret, and the glacis plate was reversed - the machine gun was on the opposite side. Both were armed with a turret-mounted Type 90 57mm (2.24 inch) gun and two Type 91 6.5mm (.255 caliber) machine guns, one of which was mounted in the back of the turret. The low-velocity 57mm gun was no match for the high velocity 37mm (1.46 inch) gun on American M3 tanks and the I-Go could not penetrate the M3's armor and was slower, being more of an infantry tank. American intelligence believed there were two models of the I-Go, the Type 89a, the Type 89b and the Type 94. The Type 89b and the Type 94 were the same tank, based on the French Renault FT-17. 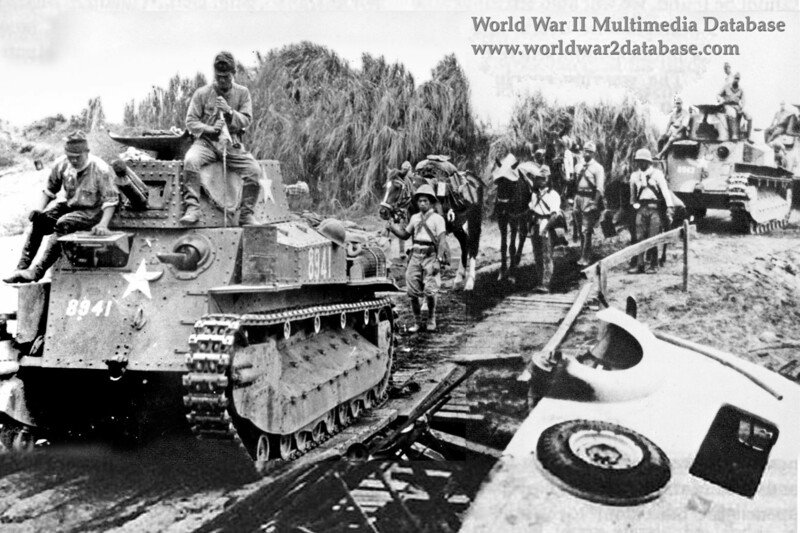 These 1st Company tanks, identified by the white star on the glacis plate, and horse units are crossing an improvised bridge north of Manila at the same time other units of the 7th Tank Regiment entered the city. The 7th Tank Regiment often worked with the 48th Engineer Regiment to cross Luzon's rivers. An American Ford model 1939 ambulance lies in the river. Colonel Wibb E. Cooper (August 14, 1885 - February 8, 1983), Surgeon of the United States Forces in the Philippines, later wrote, "Routes were frequently under heavy artillery fire and were also exposed to aerial bombardment, the work of the ambulance drivers was especially worth of commendation. I mention this tactical situation only to give some idea of the distances involved in our effort to render medical service to our command. These distances had to be covered by ambulances operating over winding, narrow trails that had been carved through the jungles of Bataan by our corps of engineers." Cooper had limited numbers of ambulances, but refused to pull ambulances that served civilian populations from urban areas unless their was no choice. An alternate view of this scene, which includes the Type 89a Ko tank in view, was published in the June 29, 1942 issue of LIFE Magazine, which identified the location as Burma, but the white star indicates the 7th Tank Regiment in Burma.